All species of carpet beetles undergo complete metamorphosis, passing through the egg, larval, and pupal stages before developing into adults. Most carpet beetles develop up to four generations yearly, while varied and black carpet beetles develop only one. 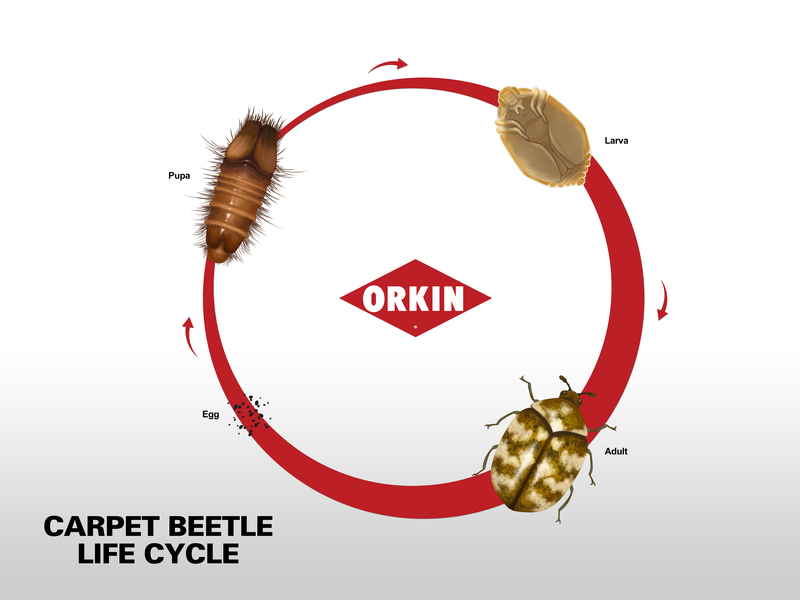 The life cycle of a carpet beetle ranges from two months to several years in length. Larval food sources play a significant role in determining the duration of a carpet beetle’s growth cycle. The life cycle of the carpet beetle begins when an adult female lays her eggs. Carpet beetles can lay their eggs indoors, although they may also infest the nests of birds, mice, and other insects. After mating near sources of light, females can lay more than 100 eggs at a time, which will hatch into larvae within seven to 35 days. Larvae can survive for several weeks without food. The duration of the carpet beetle’s pupal phase varies, and adult carpet beetles emerge in spring or summer. Carpet beetle young develop into adults within nine months to two years, while adults survive only a few weeks. Infestations of carpet beetles are usually discovered when the homeowner notices damage to fabrics, presence of shed larval and pupal skins, or actually seeing movement of larvae and flying adults, often near sources of light. The egg and pupa stages are not mobile or active, plus the eggs are very small and sometimes very hard to see. The obvious concerns for homeowners are the damage to infested items and the nuisance of flying adults inside the home.